Email is an inherently different customer service channel than phone. For email, agents need a unique skillset to provide high-quality service. This course enables your agents to provide top-notch customer service through well-written and properly structured emails. It covers the important topics of structure, punctuation, and word-choice. This program is ideal for both onboarding new hires as well as upskilling agents that are new to the email channel. Communicating with customers via email is inherently different than over the phone. Agents can find it more difficult to fully understand a customer’s request in an email, or to express themselves in an empathic and easy-to-understand manner. When we lose access to vocal tone and body language, the words we choose can be more easily misinterpreted. Emails, when well written and properly structured, provide an effective means of communication between contact center agents and customers. This course is designed to upskill agents to be able to handle customer service requests via email professionally and efficiently. The course teaches how to avoid common customer complaints about emails, and it contains best practices on email etiquette. It covers punctuation rules and techniques on how to best structure an email message. In addition the impact of word-choice is explained. Apply best practices for email etiquette. Structure an email for ease of reading. In this module, we'll test your knowledge of the key learning points from the course. To score a passing percentage of 80%, you must answer 16 of 20 questions correctly. We offer bulk discounts for orders containing 5 or more seats for a program or bundle. Check our pricing options for Email Essentials below. If you apply for bulk pricing, please contact us to place your order. Excel your customer interactions on social media! This course teaches how to handle customers on various social channels. 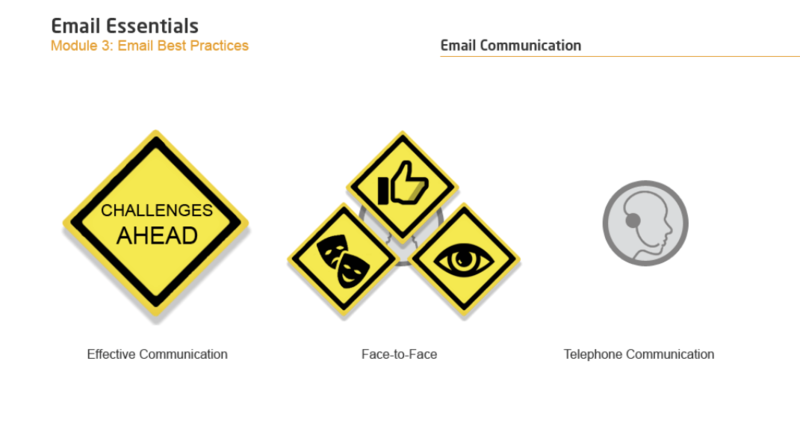 The Email Essentials program is designed by call center experts to provide a practical and engaging learning experience. Start today.